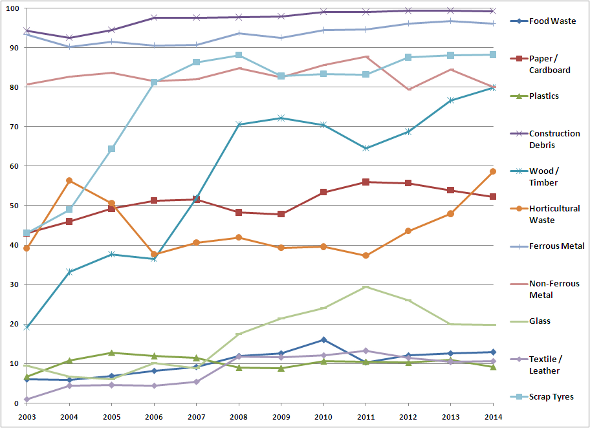 Here’s a look at the waste statistics in Singapore over 12 years from 2003 to 2014. 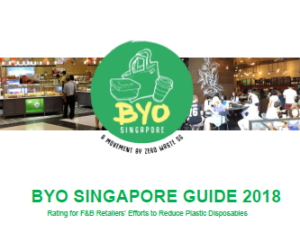 It includes figures on Waste Disposed, Waste Recycled, Waste Output (Waste Disposed + Waste Recycled) for total waste and different types of waste, and also the recycling rate (Waste Recycled / Waste Output x 100) for different types of waste. Continued from Part Three, which looked at the recycling rate of the different waste, and the opportunities for food waste reduction. This final part explores the opportunities for reducing the generation of Paper/Cardboard and Plastics waste. We will look at campaigns, companies, services, projects and tips that help to reduce paper and plastic waste. 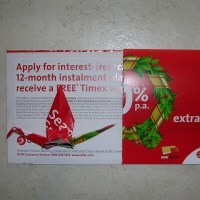 We think that there is great potential to reduce our paper mail and junk mail, and also switch to duplex printing. Canada Post offers a free epost box. With epost, users can have bills and other mailers sent to them electronically and allows them to view and store them online. Zumbox is a paperless postal system that provides a virtual mailbox for every street address in the United States, which allows users to receive, view, organize, store and send their mail online. The Red Dot Campaign is a social marketing campaign in Canada to encourage advertisers to reduce waste and resources in paper-based advertising, and evaluate their current marketing strategies. Stop Junk Mail is a non-profit UK-based group giving advice on how to reduce junk mail. They also provide ‘No junk mail’ stickers for households to paste on their door and letterbox to stop unaddressed leaflets and/or free newspapers. No distributor shall distribute or cause to be distributed any unaddressed advertising material on private property if the owner or occupant of the property has affixed a sign in a conspicuous way on his or her own property, as prescribed in accordance with Schedule “A” to this by-law indicating that he or she does not wish to receive any unaddressed advertising material. The property owner or occupant can participate in the program by purchasing a sticker to indicate their desire not to receive unaddressed advertising material. One of the easiest way to save paper in the office is to set the printer on default to print on both sides of a sheet of paper. Here’s a guide to show you the steps for setting your printer to duplex printing. Check out more tips on reducing paper. 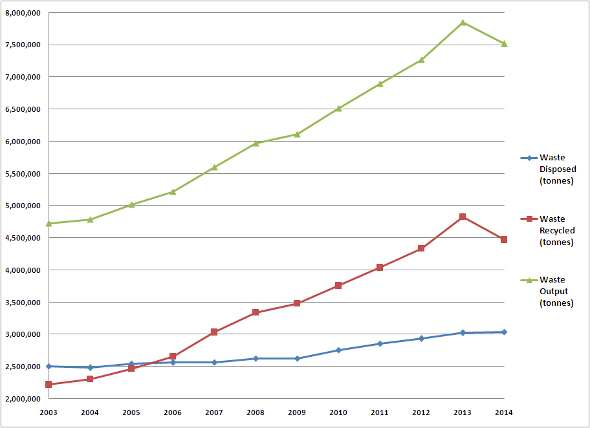 We think that there is great potential to reduce our use of plastic bottles, plastic bags and plastic packaging. Tap is an ethical enterprise and campaign to get people to rethink bottled water and switch to water from the tap. Tappening is a campaign to educate the public about the unnecessary waste of resources and harm on the environment caused by the bottled water industry, and to encourage people to drink tap water and say no to bottled water. 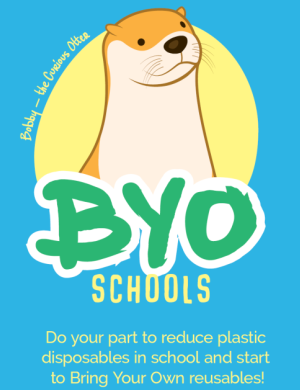 This is the National Plastic Bag Campaign in Australia to help individuals and retailers move towards a phase-out or reduction in plastic bag use. The Positive Package is a campaign to share information on reducing, reusing and recycling packaging. The online Guide to Evolving Packaging Design provides ideas, tips and tools to help retailers and manufacturers change the way packaging is produced and used. 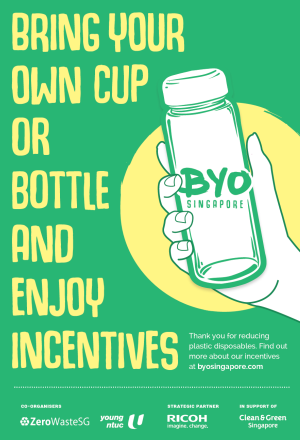 The National Packaging Covenant is a voluntary initiative by the government and industry in Australia to reduce the environmental effects of packaging. Check out more tips to reduce plastics by avoiding disposable items and choosing products with less packaging. 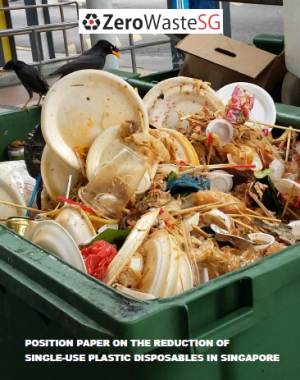 We encourage more individuals, communities, NGOs, businesses and the government to explore the mentioned opportunities to reduce the waste output of Food Waste, Paper/Cardboard and Plastics. There is potential for more awareness, campaigns, governmental and business services to reduce our waste. For a start, the new 3R Fund would be useful for providing financial support to implement these waste reduction opportunities. Read Part One, Part Two and Part Three. If you’re wondering about what to do with your used paper and junk mail, why not use them for origami – the traditional Japanese art of paperfolding. A simple piece of paper can be folded into various models – from insects, animals, birds, flowers to useful objects such as envelopes, CD cases, coasters, chopstick cases and photo frames. You can learn origami from the following web resources and turn your paper junk mail into fun and interesting paper models. Besides origami, you can also learn how to make realistic paper craft models of animals, insects and motorcycles. Check out this Yamaha Motor website with more than 50 paper models. Just download the model on used paper, fold and paste the paper parts together and you’ve got a paper model that looks just like the real thing. Enjoy! It’s easy to recycle at home. Learn about the existing recycling programme at your area and find out the type of items that are acceptable for recycling. The National Environment Agency (NEA) has implemented the National Recycling Programme (NRP) since 2001, where recycling bins are provided for residents living in HDB housing estates and landed property estates. For HDB estates, there is one recycling bin for each block of flats with 3 or 7 times collection per week. The recycling bins are usually located near the Central Refuse Chute (CRC) of newer HDB blocks, beside footpaths or linkways, and placed in open areas. 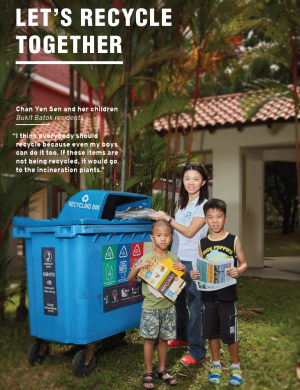 For landed property estates, one recycling bin is provided for each house with one or two collection per week. There is also a separate collection of garden waste for landed property estates. Plastic bags containing grass, leaves, and small branches can be placed beside the recycling bin. For more information, check out this NEA recycling brochure. For enquiries, call 1800-CALL NEA (1800-2255 632) or email Contact_NEA@nea.gov.sg. Find recycling bins near your home via the SLA OneMap under the Environment theme. Condominiums and private apartments are not covered under the NRP. However, it is mandatory for condominiums and private apartments to provide recycling facilities for their residents from 1 Nov 2008. If there’s no recycling facilities at your place, contact your Managing Agents (MAs) and Management Councils (MCs). 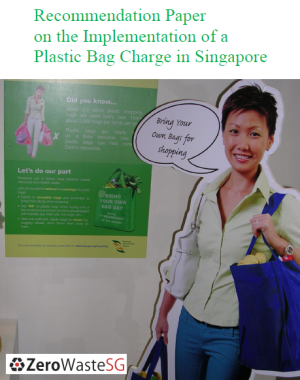 The MAs and MCs can also refer to the NEA’s online guidebook to learn how to set up a recycling programme. You can make use of the recycling programme to recycle items such as paper, plastic bottles and containers, glass bottles, metal cans and old clothing. 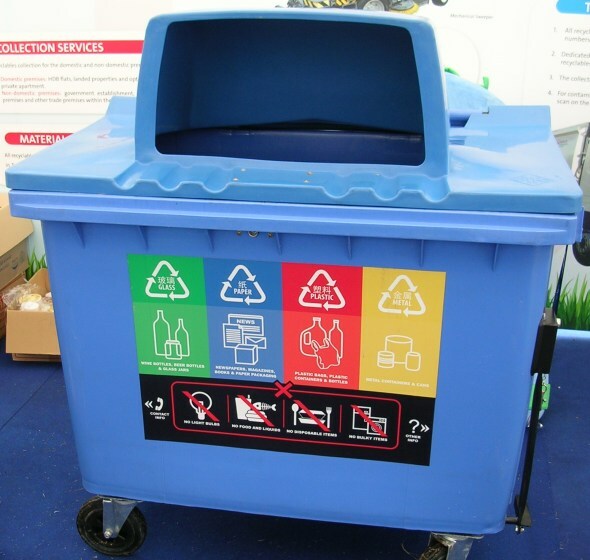 Find out what items are acceptable for recycling from this NEA brochure. The recyclables are collected by the appointed Public Waste Collector and brought back to their facility. The recyclables are sorted manually or by equipment into the different types of material. The sorted recyclables are then sent to local recycling companies for processing into raw materials or new products, or exported overseas for recycling. For enquiries on the recycling collection, you can contact the Public Waste Collector providing the recycling collection for your area.